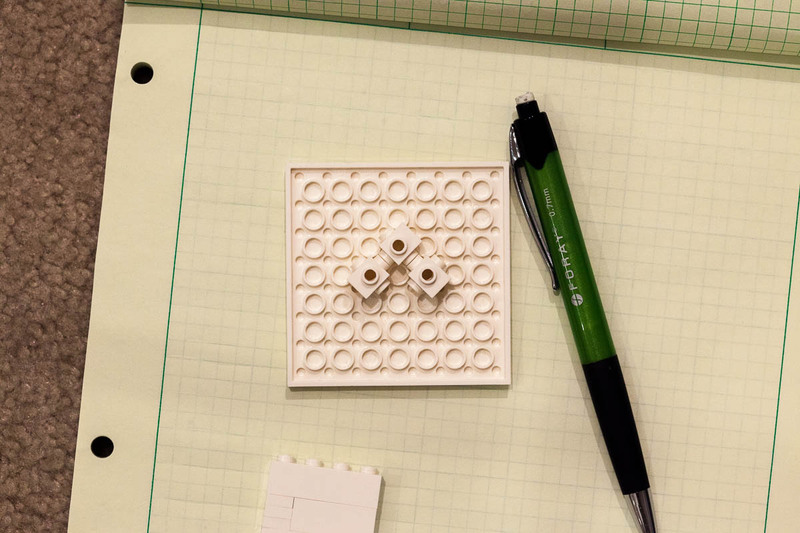 Today’s challenge: Reverse engineer the Lego brick and other common Lego components. 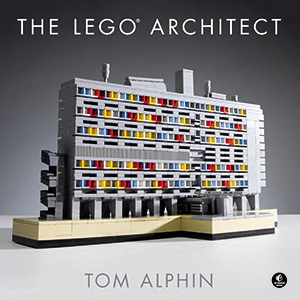 If you have spent some time with Lego bricks, you have probably noticed some basic facts. For example: A 1×1 Lego brick is taller than it is wide, the stud is a good deal wider than the brick itself, and if you look at the bottom of a longer brick you will see small solid columns or large hollow columns, and that a plate is 1/3 the thickness of a brick. You may also know the 5 to 6 ratio – 5 Lego bricks tall is almost the same length as 6 bricks wide. The goal of this project is to guess the ratios between these measurements. 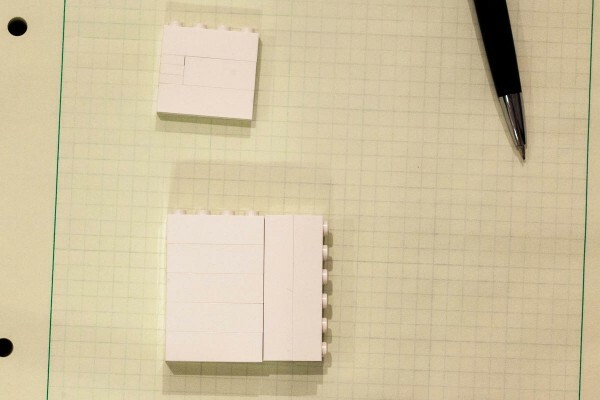 Use these simple facts (3 plates to 1 brick, 5 to 6 ratio) to make an educated guess of the relative proportions of features of common Lego bricks and components. Determine the smallest common divisor of a Lego brick, and establish this as your own “SI Unit of Lego”. 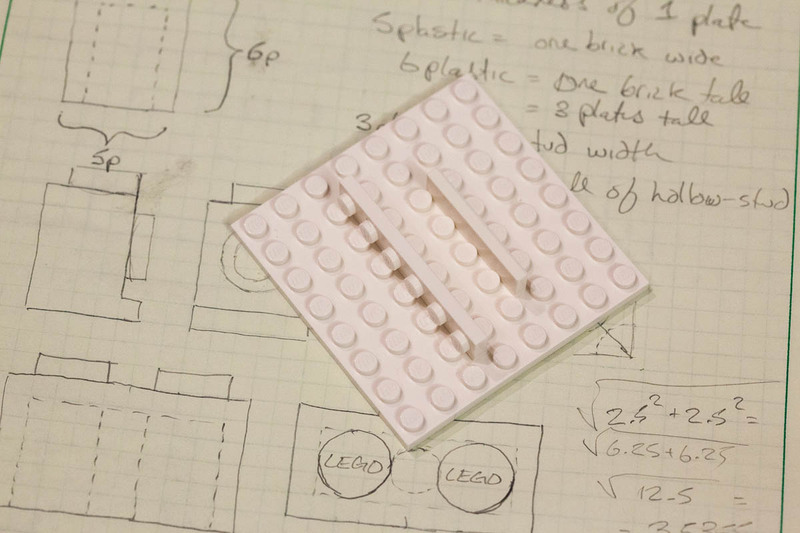 Do this without looking at your Lego bricks or measuring them. paper and trigonometry may help! Afterwards, compare your predictions against real bricks to see if they were accurate. Photo verifying that 5 bricks tall is the same as 6 bricks wide. My prediction was that the thickness of the wall of a common 1×1 brick would be 1/2 the thickness of a normal plate, and this would form a good standard unit to measure within a brick. I decided to name this unit a “Plastic” or “P” for short. If a brick is 5P wide, and each wall is 1P wide, that suggests that studs would be 3P wide. A relatively common brick that is perfect to exercising this system is brick # 4070. I predicted that the small foot on this brick would protrude 1P by 1P because I knew that the edge of the stud on top came flush to the face with the sideways-facing stud. I also predicted that there would actually be another smaller unit based on the hollow stud facing outwards on this piece. 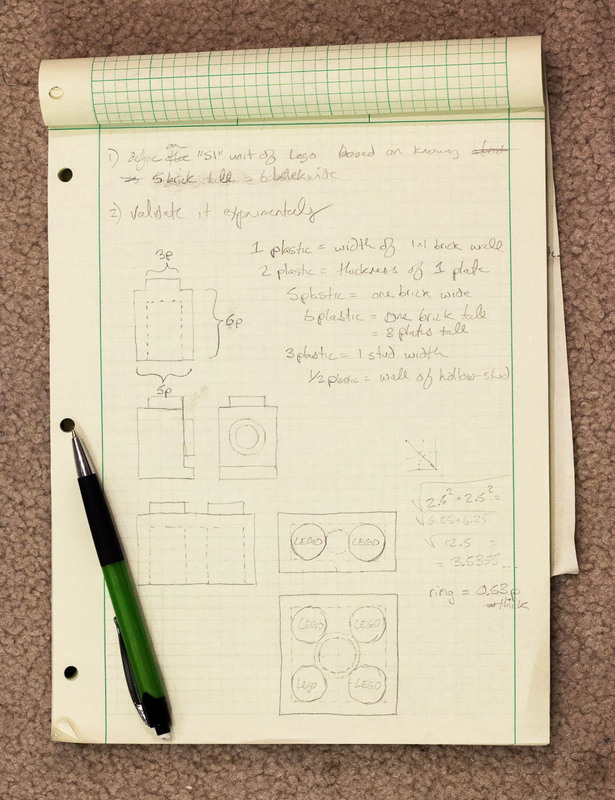 In drawing this piece on graph paper, I decided that the inner diameter of the hollow stud would be around 2p. 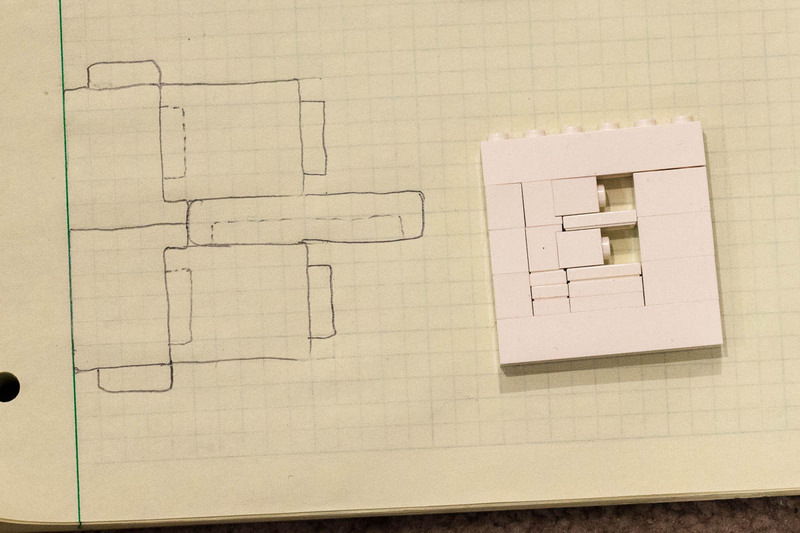 This was strictly a guess, but the resulting drawing looked to have the same proportions as a normal hollow studded brick. That means that the walls of a hollow-stud are thin, they are 1/2P, a lot thinner than the walls of a normal brick. The last challenge was determining the inner and outer dimension of the round supportive tubes on the bottom of a wide brick or plate. I knew the inner diameter of the tube would be 3P, since a normal stud can snap in there, so I used trigonometry to calculate the thickness. This results in a tube thickness a little more than 1/2P (.55P) which seemed reasonable based on my memory. My predicted values for some common Lego bricks. To verify my predictions, I built a bunch of small experiments. Experiment proving that the foot of 4070 is 1/2 of thickness of a standard plate. 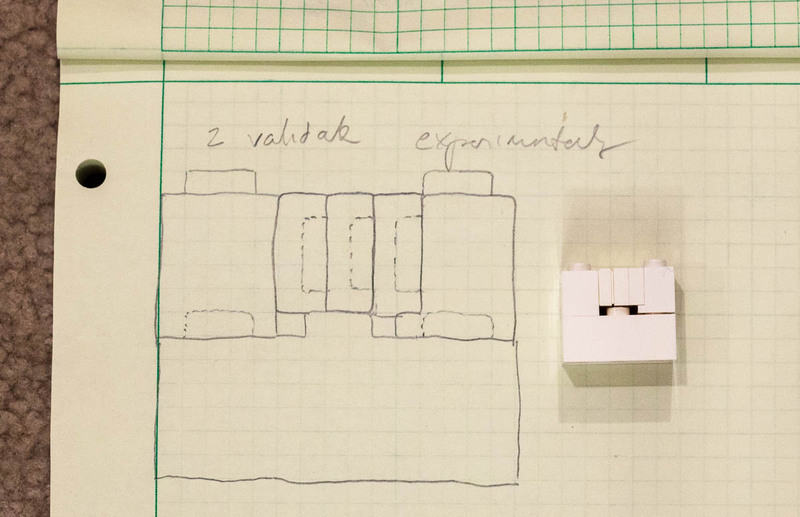 Diagram and experiment showing that stud height is about 1P. small gap between bricks placed at angle shows that tube thickness slightly exceeds 1/2P. I think it is cool that I was almost exactly right on all of my predictions. There were some small variations, but the tolerances were small and often explained by intentional wiggle room in the brick design. My apologies for not posting in a couple days – I have been out of town for some first aid training. I also wanted to let people know that Commenting was broken the last couple days and is now fixed. Thanks!